Turn on the Bluetooth wireless radio on both gizmos. Make the gizmo you’re trying to connect to discoverable. On your phone, choose the peripheral gizmo from the list of Bluetooth devices. Optionally, confirm the connection on the peripheral device. For example, you may be asked to input a code or press a button. When you’re done using the device, you simply turn it off. Because the Bluetooth gizmo is paired with your phone, it’s automatically reconnected the next time you turn it on (that is, if you have Bluetooth activated on the phone). 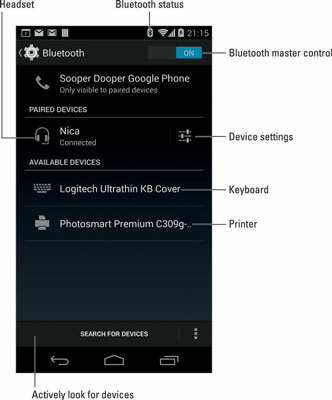 Bluetooth devices are marked with the Bluetooth logo, shown in the margin. It’s your assurance that the gizmo can work with other Bluetooth devices. Bluetooth was developed as a wireless version of the old RS-232 standard, the serial port on early personal computers. Essentially, Bluetooth is wireless RS-232, and the variety of devices you can connect to and the things you can do with Bluetooth are similar to what you could do with the old serial port standard. You must turn on the phone’s Bluetooth radio before you can use one of those Borg-earpiece implants and join the ranks of the walking connected. To turn on Bluetooth, open the Settings app and slide the master control next to Bluetooth to the On position. When Bluetooth is on, the Bluetooth status icon appears. It uses the Bluetooth logo. To turn off Bluetooth, repeat these steps, but slide the master control to the Off position. You can turn on Bluetooth also by choosing the Bluetooth quick action. When the Power Control widget is installed on the Home screen, touch the Bluetooth icon to turn it on. Activating Bluetooth can quickly drain the phone’s battery. Be mindful to use Bluetooth only when necessary, and remember to turn it off when you’re done. Touch the Search for Devices button. You see a list of available and paired devices. Don’t fret if the device you want doesn’t yet appear in the list. For example, some Bluetooth gizmos have a tiny button to press that makes the device visible to other Bluetooth gizmos. Likewise, if the other device needs to see the phone, touch the phone’s name at the top of the Bluetooth screen. That action makes the phone visible to the other device. The phone and Bluetooth device attempt to pair. You may be required to type the device’s passcode or otherwise acknowledge the connection. After pairing, you can begin using the device. To break the connection, you can either turn off the gizmo or disable the Bluetooth radio on your phone. Because the devices are paired, when you turn on Bluetooth and reactivate the device, the connection is instantly reestablished. How you use the device depends on what it does. For example, you use a Bluetooth headset to talk and listen on the phone. As long as the headset is paired with the phone and powered on, you can use it. When a Bluetooth headset is paired, a Bluetooth icon appears on the in-call screen. Use that icon to switch between a Bluetooth headset and the phone’s microphone and speaker. You can turn the Bluetooth earphone on or off after it has been paired. To unpair a device, touch the Settings icon by the device’s entry in the Bluetooth screen. Choose the Unpair command to break the Bluetooth connection and stop using the device. Bluetooth can use a lot of power. Especially for battery-powered devices, don’t forget to turn them off when you’re no longer using them with your phone.